Pain in the right temple area can sometimes be the result of temporal arteritis, a condition which affects the temporal arteries that supply blood to head and brain. Temporal arteritis can present as a stabbing pain in the right temple, a dull pain in the right temple, a pain only when the right temple is touched, or pain in the temple and elsewhere on your head. Since temporal arteries are what keep your brain properly fed with blood, any condition that disrupts it is a potential cause for concern. Although pain in the right temple is not always caused by temporal arteritis, knowing when this might be the case can be an important step in recognizing when to seek medical attention and treatment. What Causes Pain in the Right Temple? Regardless of the name being used, the reason why temporal arteritis causes pain is the same. When the condition flares up, the lining of the affected artery will become inflamed and swell up. The swelling narrows the blood vessel and reduces the amount of blood that can get through. The tissue normally fed by the vessel then starts getting starved, resulting in pain and other symptoms. Since the arteries supply more than just your scalp or brain, this swelling may result in pain in the right temple and jaw, eye, ear, or other areas that share the blood supply. There is no known cause of temporal arteritis, but there are a few suspected culprits and possible risk factors. An autoimmune reaction is when your body’s defenses attack normal tissue. One theory is that temporal arteritis might be a result of the body mistakenly thinking the artery is diseased, since inflammation is controlled by the immune system. Temporal arteritis sometimes occurs in patients who have been given large doses of antibiotics during severe infections. Whether this observation might be a result of the specific antibiotic, the dosage, the infection, or a combination is unclear at this time. Temporal arteritis has been seen to run in some families. This suggests that, while it may not be hereditary, there could be some people who are genetically predisposed to it. This is an inflammatory disorder that causes muscle pain and stiffness, most commonly in the shoulders. Although an exact connection hasn’t been identified, about half the people who have temporal arteritis also have polymyalgia rheumatica, so the possibility of a link is hard to ignore. Temporal arteritis almost exclusively affects adults, and even then it’s rare to find someone under 50 who has the condition. Most people don’t develop it until their 70s or 80s. Temporal arteritis sometimes occurs in patients who have been given large doses of antibiotics during severe infections. Other possible causes of temporal arteritis include autoimmune reactions, genetics, polymyalgia rheumatica and age. In order to determine whether your symptoms are the result of temporal arteritis or some other cause, your doctor will perform a physical exam along with certain laboratory tests. An erythrocyte sedimentation rate test, which looks at how quickly your red blood cells build up on the bottom of a test tube over time. Higher results indicate an inflammation. A C-reactive protein test, which checks the levels of a protein your liver makes when the body is injured. Higher results mean there is an inflammation somewhere. Hemoglobin or hematocrit tests to look at the amount of hemoglobin in the blood or how much of your blood is made up of red blood cells. Cranial ultrasounds can help look for signs of inflammation or issues with the arteries. A biopsy of the suspected artery. This is the only way to get a definitive diagnosis, but it’s not usually done unless the tests suggest an arterial problem. Unsurprisingly, letting your head become starved of blood can have unpleasant complications if treatment is delayed for too long. Not only will the inflammation itself potentially cause further problems to other blood vessels and arteries, but the starved tissue can begin to deteriorate and lead to permanent or fatal consequences. Due to the seriousness of these complications, treatment is often started when temporal arteritis is first suspected and while a final diagnosis is still being established. The good news is that medications are fully capable of treating the inflammation caused by temporal arteritis, reducing the swelling, pain, and other symptoms by letting your head get the blood it needs. The bad news is that there is no cure and the treatment does have side effects, so further action is often taken to help mitigate these problems. Corticosteroids (taken orally) are very effective and can provide relief with only a few days of treatment. However, treatment is often needed for up to two years and taking steroids for that long will cause side effects. Specifically, steroids make you more vulnerable to osteoporosis and hypertension and can cause muscle weakness, cataracts, or glaucoma. Other, but less common side effects include weight gain, raised blood sugar, thinner skin, insomnia, reduced immune function, and greater vulnerability to bruises. Various remedies or other prescriptions are often provided to help reduce the risk or strength of these side effects. 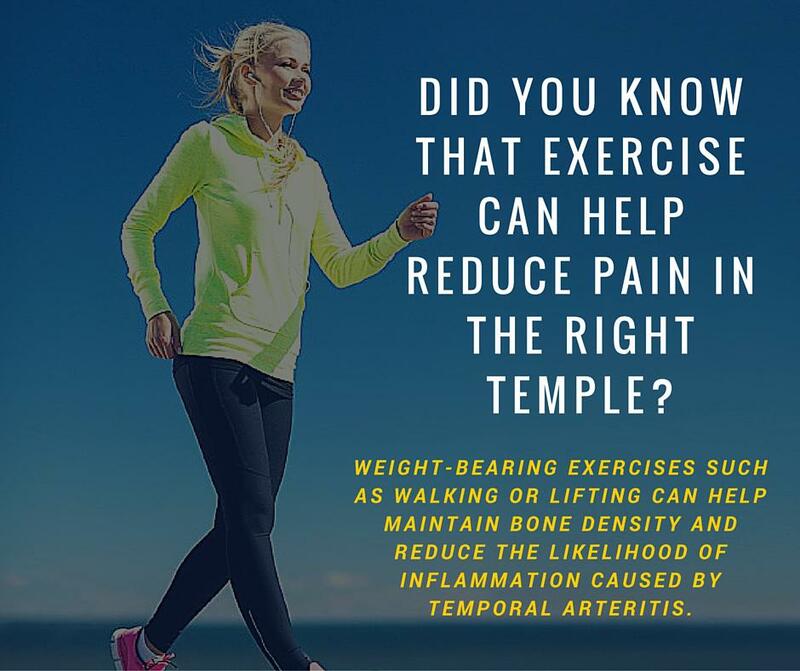 Weight-bearing exercises such as walking or lifting help maintain bone density and can reduce the likelihood of fractures. 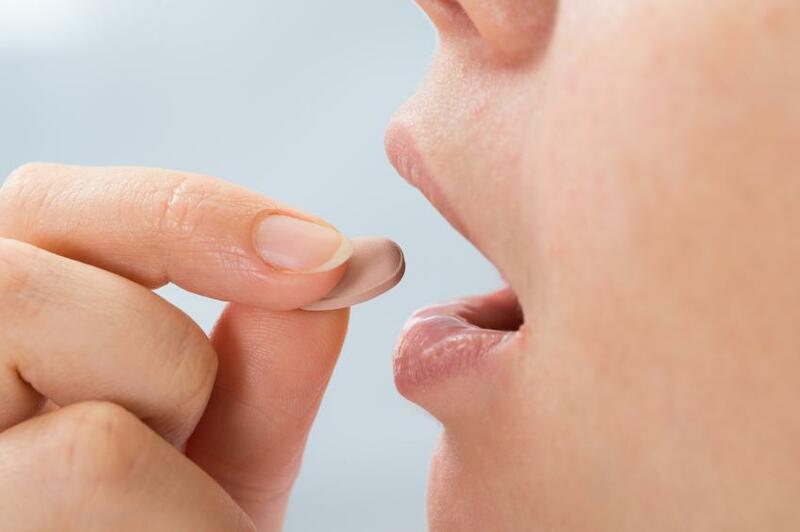 Calcium and vitamin D are important for maintaining the integrity of your skeleton, so supplements are often used to help mitigate the bone-thinning effect of long-term steroid use. Dietary increases in calcium and vitamin D can also help. Although you will not need to keep track of your blood sugar as often as a diabetic, it will be important to get occasional checks in order to make sure the steroids are not raising your glucose to an unhealthy level. Regular bone density screenings will also be needed to monitor any bone thinning and osteoporosis risk. Since a headache is a common and often benign symptom, it can be hard to tell when you should seek medical attention for pain in the right temple. Not all headaches are due to temporal arteritis, but some are and more can be caused by other, equally concerning ailments. A pre-existing headache begins to get steadily worse or starts showing significant changes in pattern, duration, severity, etc. “Temporal Arteritis,” Medline Plus web site, last updated April 5, 2016; https://www.nlm.nih.gov/medlineplus/ency/article/000448.htm, last accessed April 20, 2016. “Headache: When to Worry, What to Do,” Harvard Health Publications web site, last updated September 30, 2015; http://www.health.harvard.edu/pain/headache-when-to-worry-what-to-do, last accessed April 20, 2016.